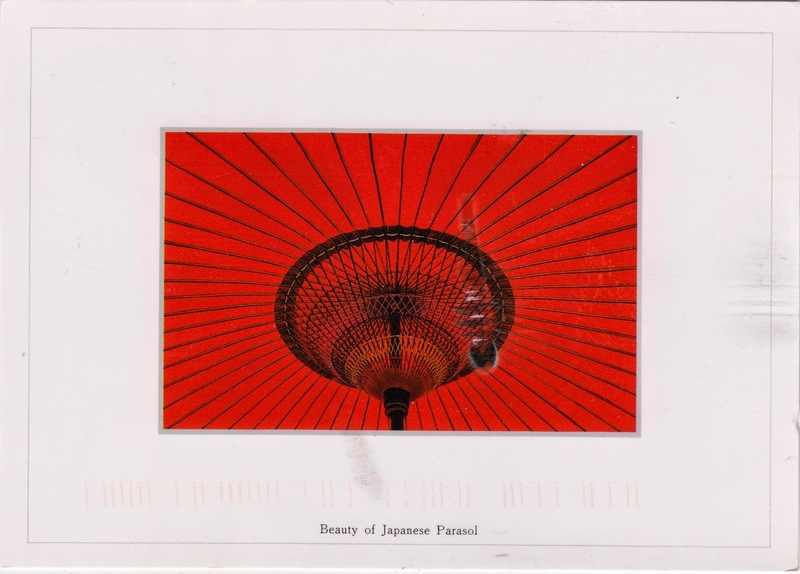 Postcard JP-641295 from Japan shows a special style of hand made oil-paper umbrella (野點傘) made in Kyoto, Japan. As part of Kyowagasa (京和傘) family, they are completely handmade under the tea house principle of "serenity" and "elegance", with the handle and scaffold made from bamboo of Kameoka, Kyoto; the umbrella skin made from Meinong paper of Gifu and brushed with sesame oil. Those parasols are widely used in sacrificial ceremonies at temples and shrines, and in other traditional ceremonies around the country in Japan.